Although it seems from the volume of the posts (this being the eighth in the series) that I have spent a lot of time on the manuscript but not gotten very far along the road, the opposite is truer: All that has gone before, with the exception of editing the reference list, took very little time. It takes longer to describe my steps than to perform them. Each of the previous steps were necessary in my methodology as preludes to getting me to the point where I actually edit the manuscript. Now it is time to discuss some of the things done while actually editing the manuscript. I begin with reference renumbering. 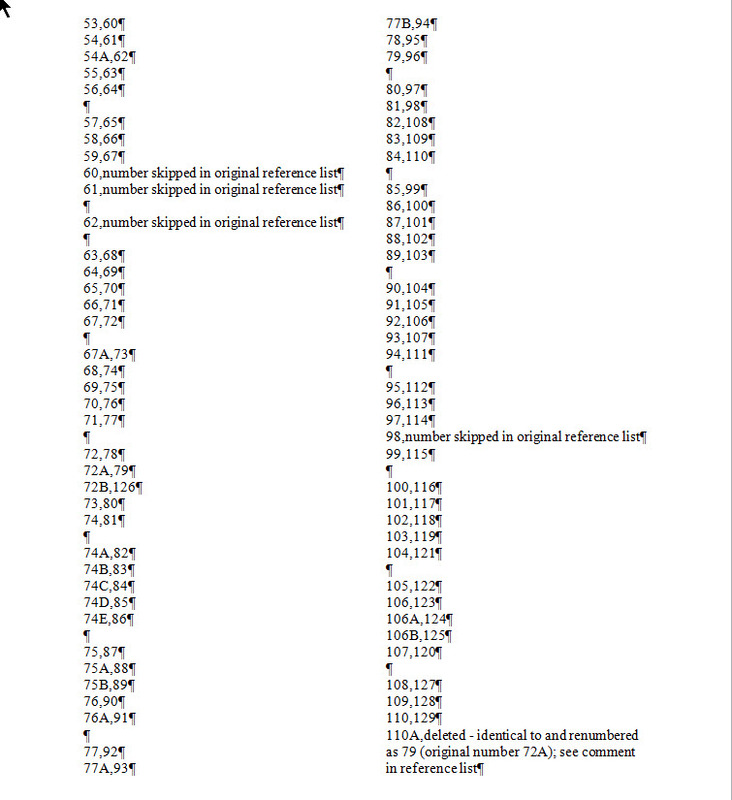 Not all manuscripts require reference renumbering, but a significant number do. The last major project I completed had 82 chapters made up of 10,000 manuscript pages and thousands of references (several chapters had more than 1000 references and many had between 500 and 900 references; the entire project had more than 21,000 references). 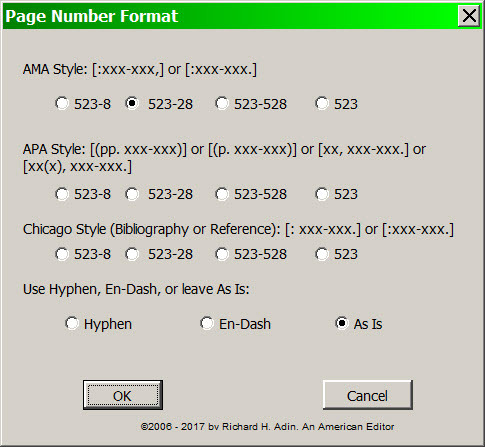 Of those 82 chapters, 76 required reference renumbering; quite a few required renumbering beginning within the first 10 references (and one chapter had a half-dozen references that had to be inserted before reference 1). Even if it turns out that a chapter’s references do not require renumbering, I need some way to make sure that references are called out in order; it is not unusual to have earlier references recalled out so that there is a sequence like this: 21, 22–24, 25, 26, 23, 27. I used to try to track the reference numbering and renumbering using pencil and paper; then I graduated to using an Excel spreadsheet. Both methods worked but they were cumbersome and time consuming. In addition, there wasn’t an easy way, in a chapter that required extensive renumbering, to quickly and easily track the renumbering. 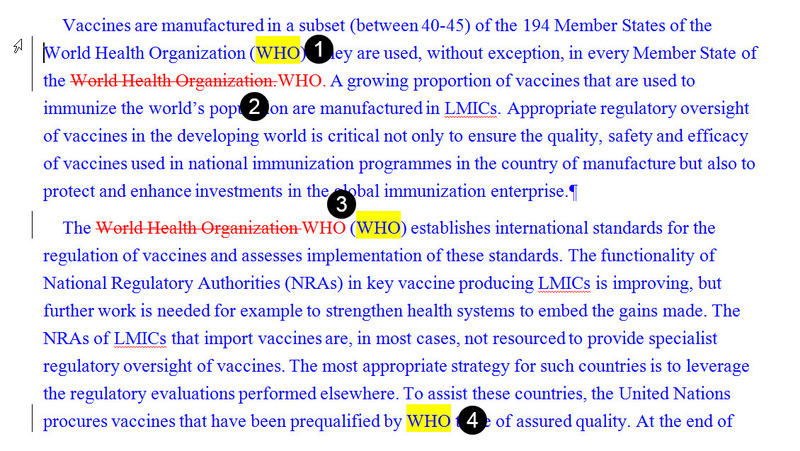 Below is a sample page from a report generated by the References # Order Check macro (you can make the image, as well as other images in this essay, larger by clicking on the image). 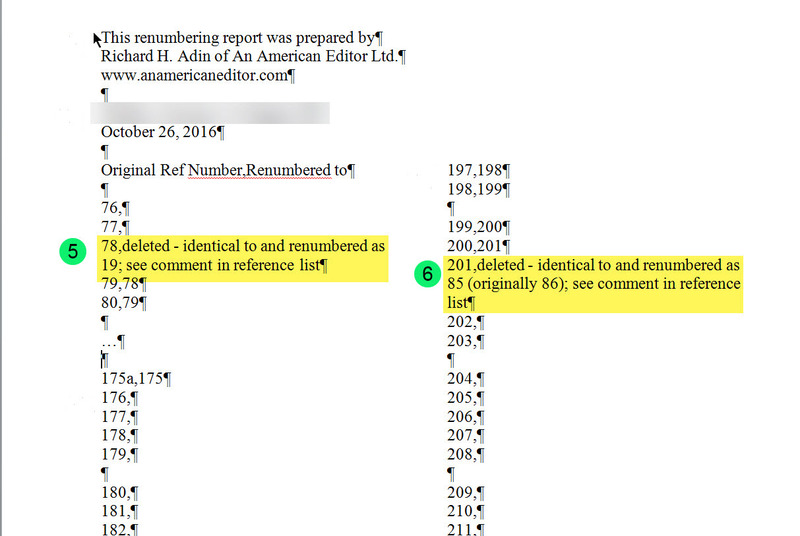 The format of the report is as follows: In the first shown entry (53,60), 53 is the original reference number as assigned by the author and found in the original reference list; 60 is the renumber value, that is, what was once numbered 53 is now renumbered as 60. As you look at the sample, you will see some numbers are followed by explanatory comments. If you would like to see the complete report, it is available for download from wordsnSync. 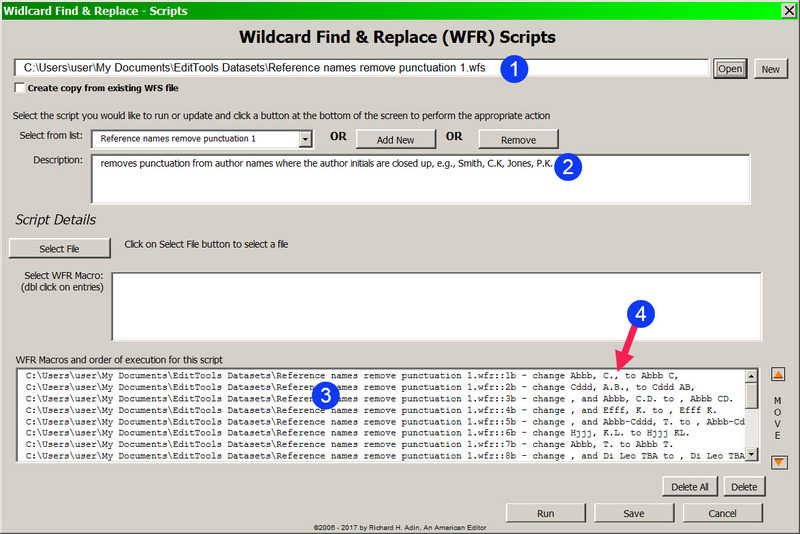 The file is a PDF named Sample Reference Renumbering. For details on how this to use this macro, see Reference # Order Check. For purposes of this essay, there are only a couple of things to note. 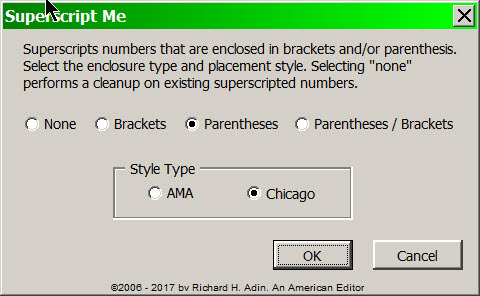 First, when I come to a reference callout in the text, assuming it does not need renumbering or a comment, I click on the corresponding number in the left numbering field (#A in image above). Doing so let’s me track what the next callout number should be. For example, if I have clicked on 1 to 7, I know the next numbered callout should be 8. If it is, I click 8; if instead it is 10, then I know I need to renumber. 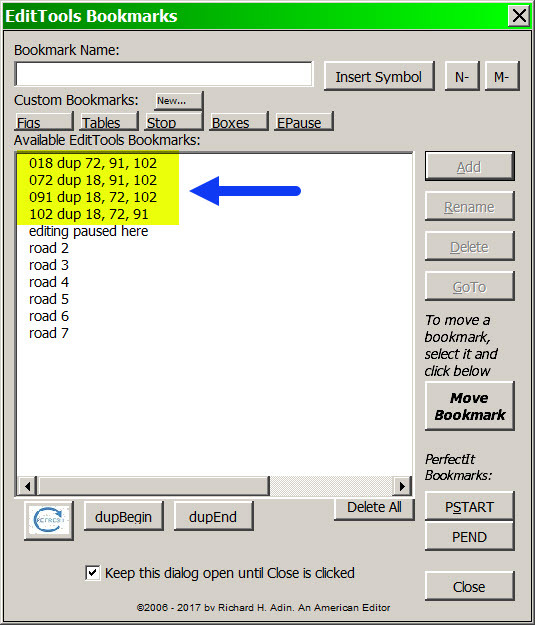 Renumbering is done by clicking in the blank field next to the number 10 in the main Renumber: field (#B in image). That will put the 10 in the Original: field (#C in image) and I enter its new number — 8 — or a comment or both in the Renumber: field (also at #C) and click Modify. The new number or the comment or both will appear in the main field (#B) opposite 10, and 8 will be removed from the left numbering field (#A). If the next callout is number 8, I repeat the renumbering process and renumber 8 as 9. And so it goes. 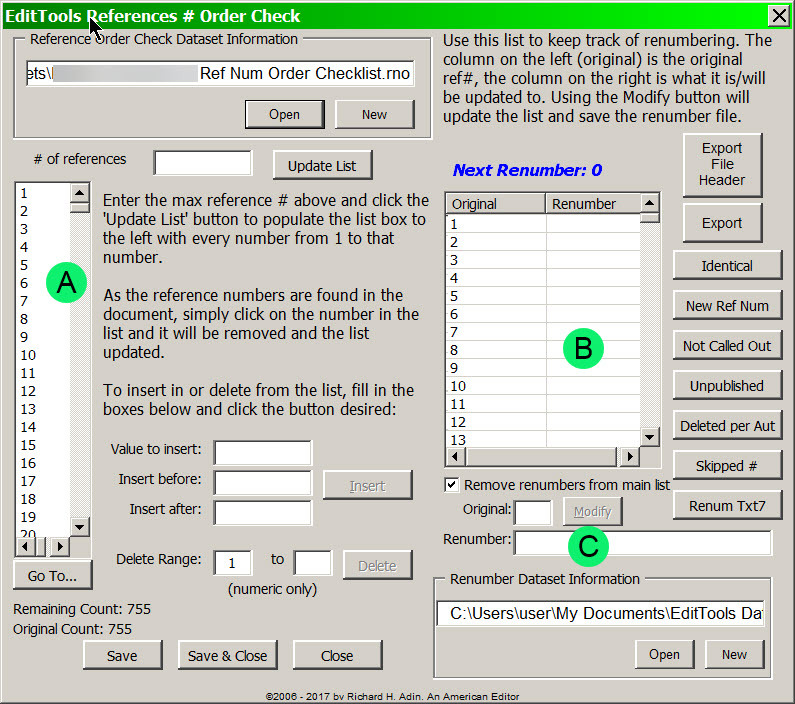 The Reference # Order Check macro does much more to help with numbering/renumbering, but a discussion of what else it does isn’t needed here. 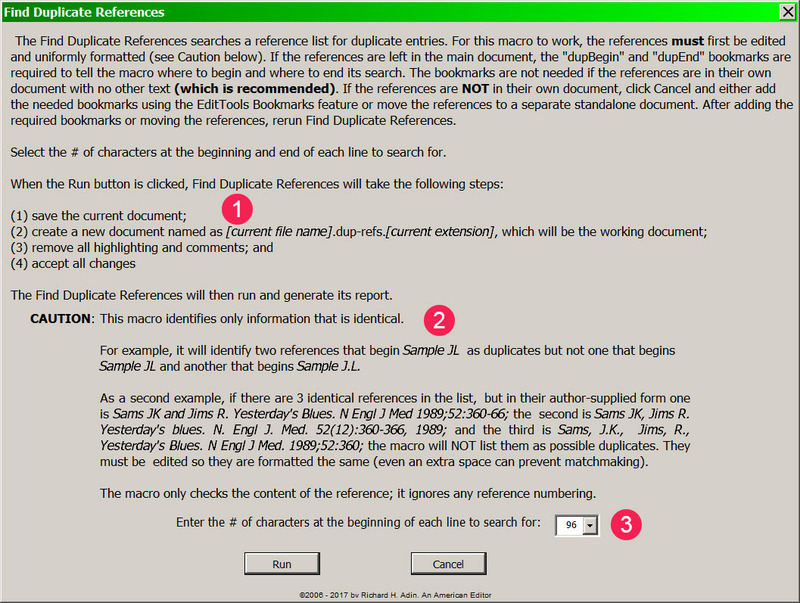 Take a look at the report the macro generates (see the complete Sample Reference Renumbering); I send a report to the client with every chapter/manuscript that requires reference list renumbering. I do one more task before beginning actual editing: I open Bookmarks and the Managers for Toggle Word and Toggle Word Specialty. I also open Click List. I keep these open on one of my monitors (I use a three-monitor setup) because these are things I access frequently. With some projects, I also keep open the Never Spell Word Manager. In a large project, I will keep the NSW Manager open as I edit the early chapters, but with later chapters, I only open it when needed. 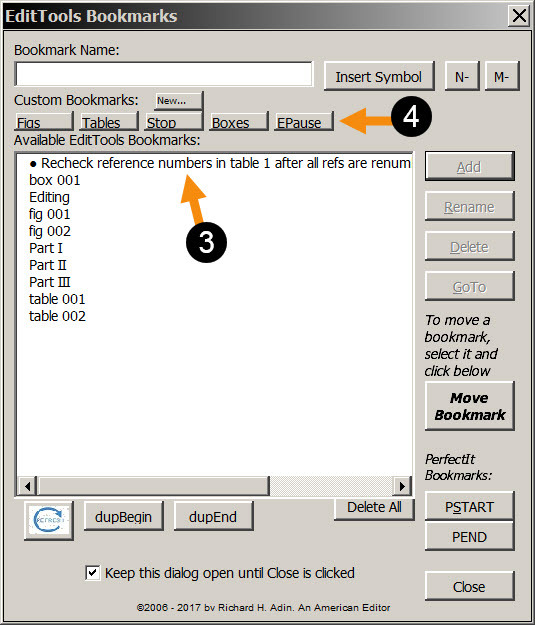 Bookmarks have already been discussed (see The Business of Editing: The AAE Copyediting Roadmap IV). 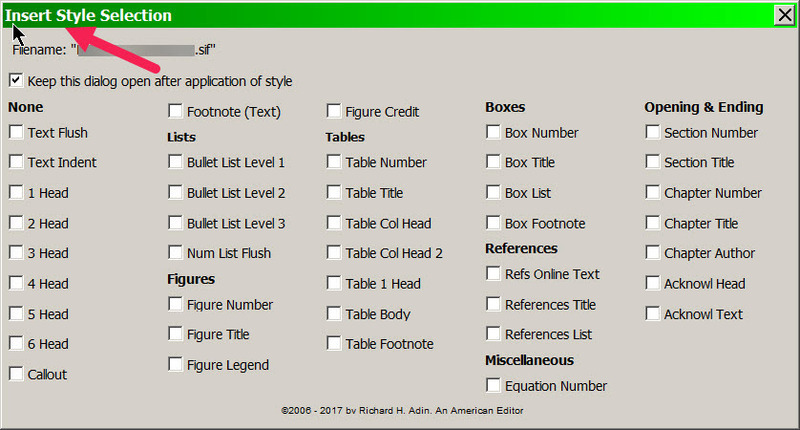 Click List lets me insert items with a single click. Take a look at the Click List image below. In the image, the Symbols tab is showing. 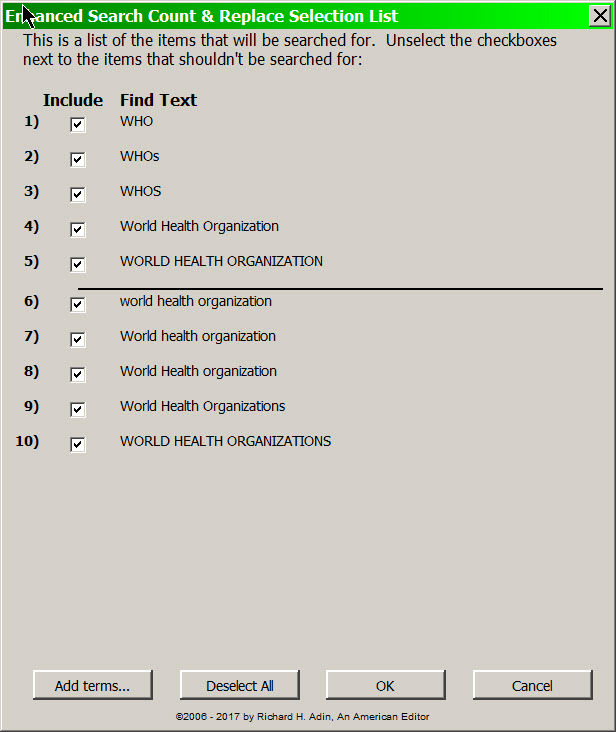 Before Click List, if I needed to insert a division sign (÷), I had to open Word’s Symbol dialog, search for the symbol, and double-click it to insert it into the document. It took time — sometimes a lot of time, sometimes only a little time — to find the symbol I needed. 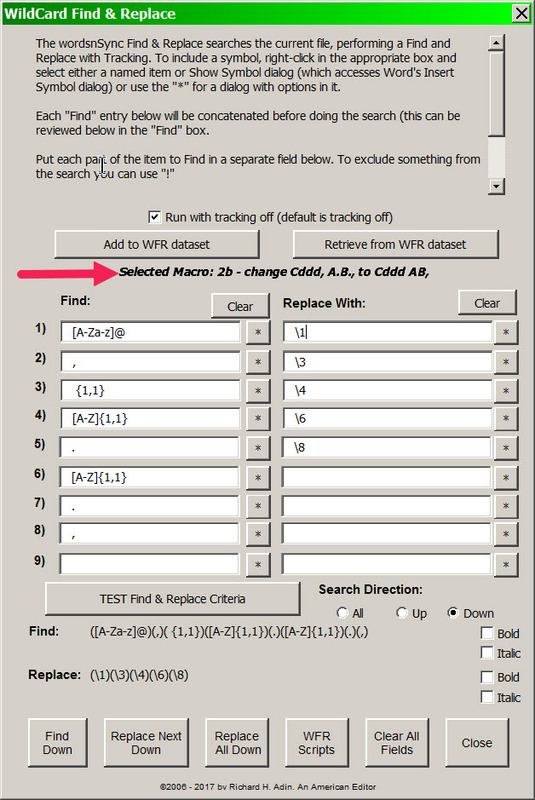 With Click List, I do that search once, add the symbol and my own name for it using the Click List Manager, and thereafter I insert it with a single mouse click from Click List. 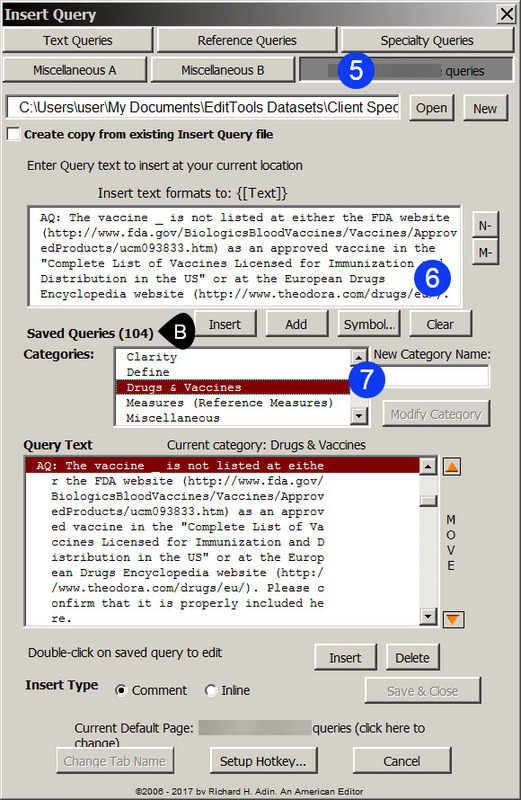 The Click List can be used for just about anything, from a symbol (e.g., ä or ≈ or Ǻ) to a lengthy phrase (e.g., including the opening space, “ of total antigen per dose” or “References for this chapter are available at Xxxxx.com.”). 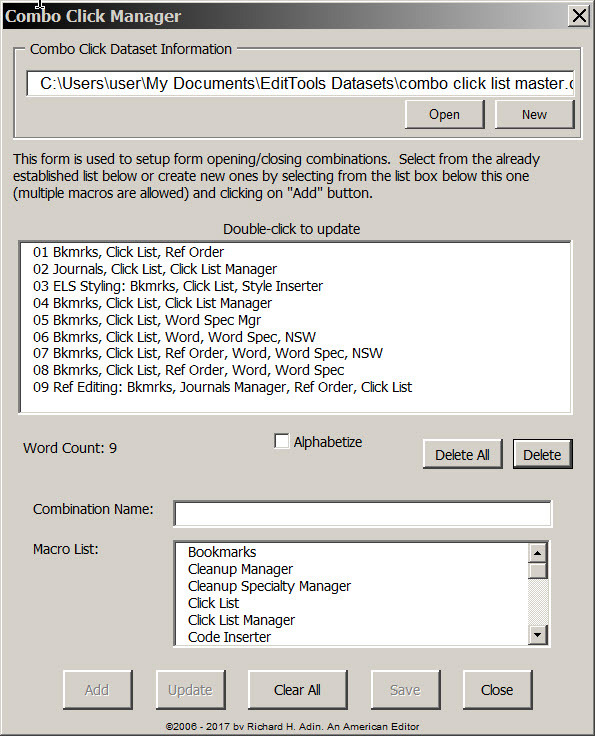 Click List is an excellent example of creating the wheel once and reusing it. The Toggle macro lets me select a word or phrase or acronym/initialism and change it quickly, easily, and, most importantly, accurately. Although I can type, I still make lots of typing errors. For example, it isn’t uncommon for me to type chatper instead of chapter. 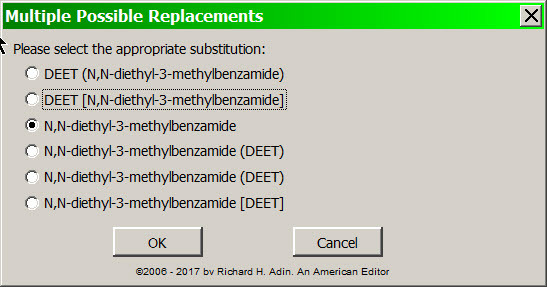 In that case, autocorrect takes care of the error, but things get dicier when I need to type N,N-diethyl-3-methylbenzamide. I may not notice a mistyping, which would be a tragedy, but even more tragic — for me — is the time I need to spend to type it, check it to make sure it is correct, and correct it if wrong. A couple of clicks is much better — quicker, easier, more accurate, and profit-enhancing. 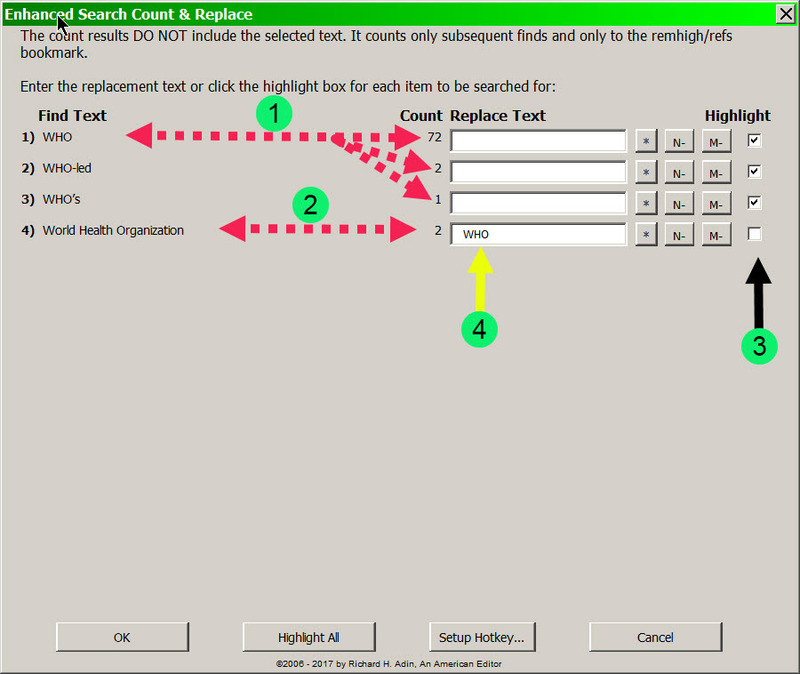 Toggle displays my options based on what I have entered in the dataset. 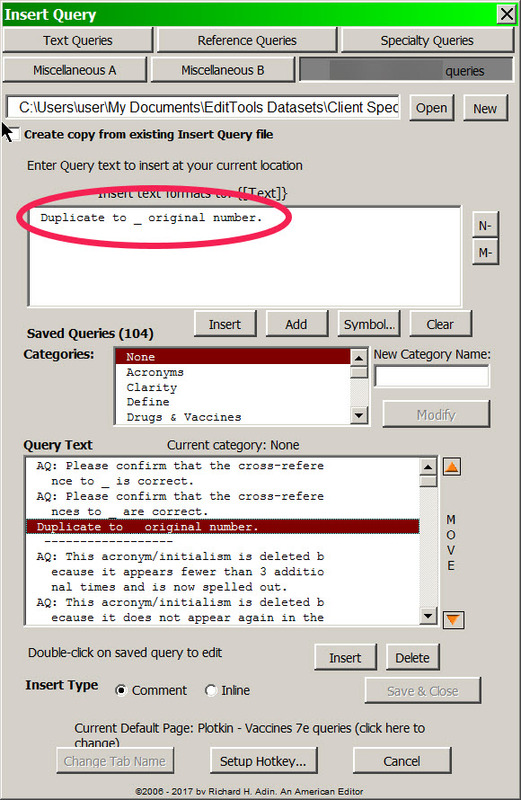 (If there are no options, it just makes the change that is in the dataset.) It is important to note that Toggle checks all of the datasets that appear in the Toggle Manager as well as the designated Toggle Specialty dataset, not just the dataset for the topmost tab. The image of the Toggle and Toggle Specialty Managers above shows 11 datasets — one for each tab plus the specialty — and when I run Toggle, it checks all of them for the selected word and displays all of the options. I choose the option I want and click OK. The word or phrase is replaced, no typing involved. 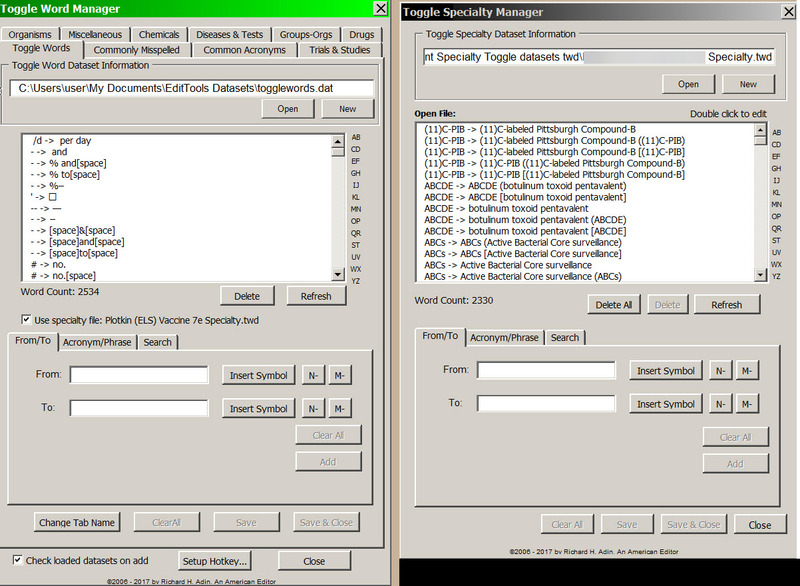 I keep the Toggle and Toggle Specialty Managers open as I edit so I can add new words to the datasets. The idea is to create the wheel once and reuse it; Toggle is a macro that lets me do that during editing. EditTools macros are intended to make editing quicker, easier, more accurate, and more profitable. Consequently, easy access to regularly used macros is important. Most of the macros in EditTools can be assigned to keyboard shortcuts or Hotkeys. This is easily done by either clicking on the Setup Hotkey button, which is generally found at the bottom of a macro’s Manager, or by clicking the Hotkeys menu in the Preferences section of the EditTools toolbar. I have assigned Hotkeys to those macros and managers that I use frequently. Because I keep the Toggle Word Manager open as I edit, it does not have an assigned hotkey — it is opened once and left open; in contrast, the Toggle macro is assigned a hotkey because it is not a macro that is (or can be) kept open but it is accessed frequently. 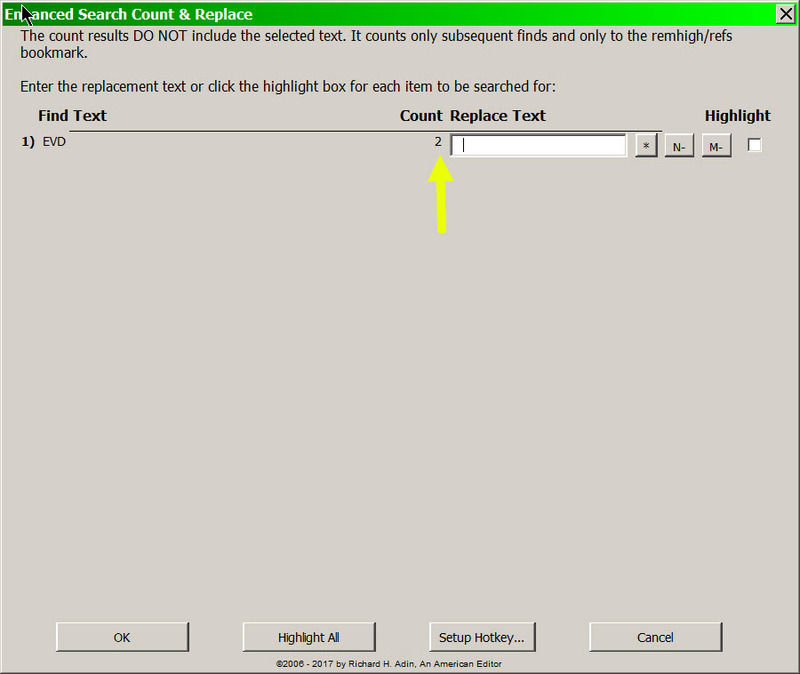 Examples of other macros I have assigned to hotkeys are Enhanced Search, Count, & Replace; Smart Highlighter; and Insert Query. You can (and should) customize Hotkeys to fit your needs. 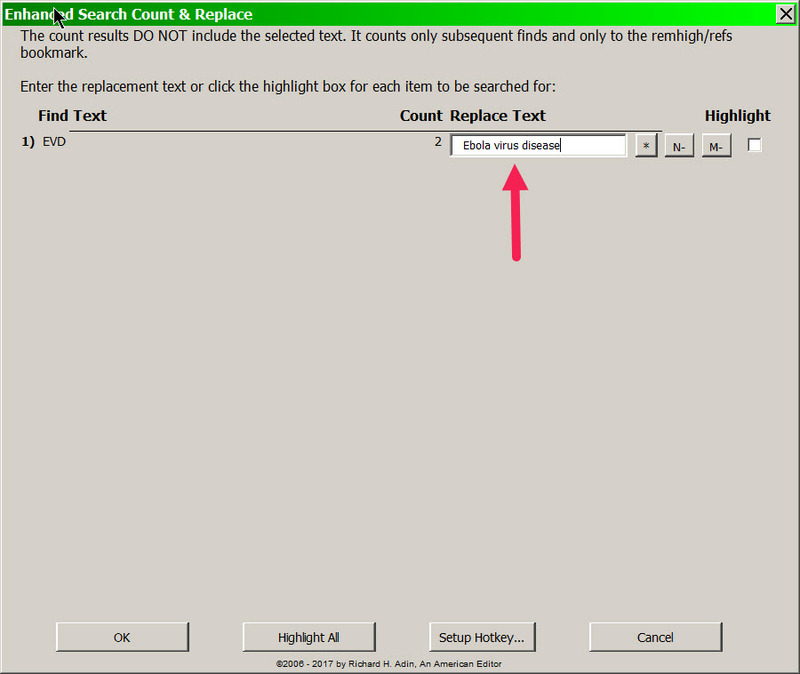 Another macro I use often during editing is Enhanced Search, Count, and Replace, which is the subject of The Business of Editing: The AAE Copyediting Roadmap IX. I am now nearly at the point where I actually begin editing the manuscript itself. I’ve created a stylesheet and cleaned the document (see The Business of Editing: The AAE Copyediting Roadmap II), and tagged the manuscript by typecoding or applying styles (see The Business of Editing: The AAE Copyediting Roadmap III), and inserted bookmarks for callouts and other things I noticed while tagging the manuscript (see The Business of Editing: The AAE Copyediting Roadmap IV). 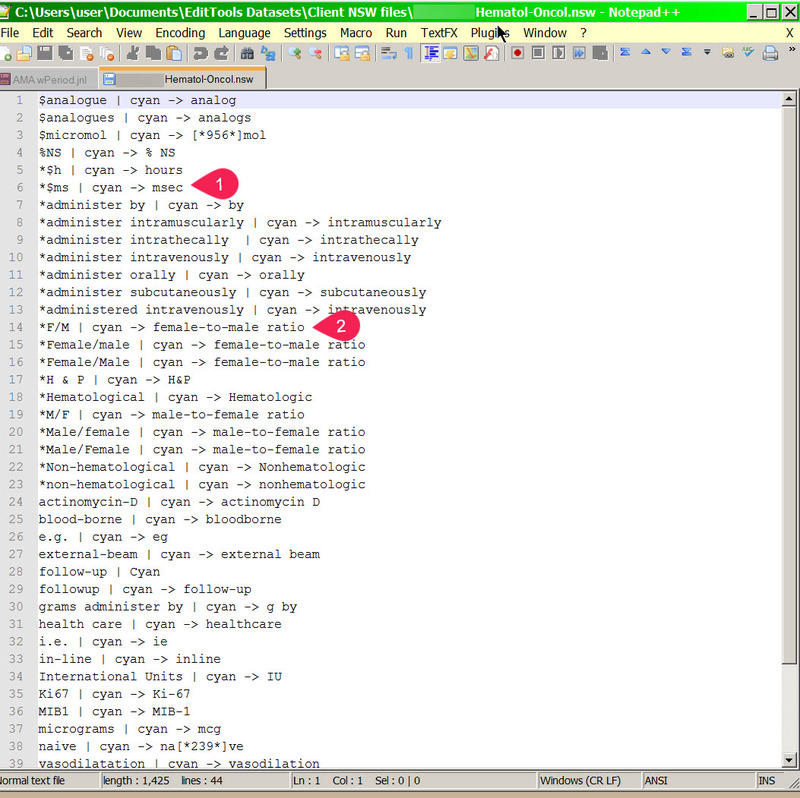 Now it is time to create the project- or client-specific Never Spell Word dataset and then run the Never Spell macro. 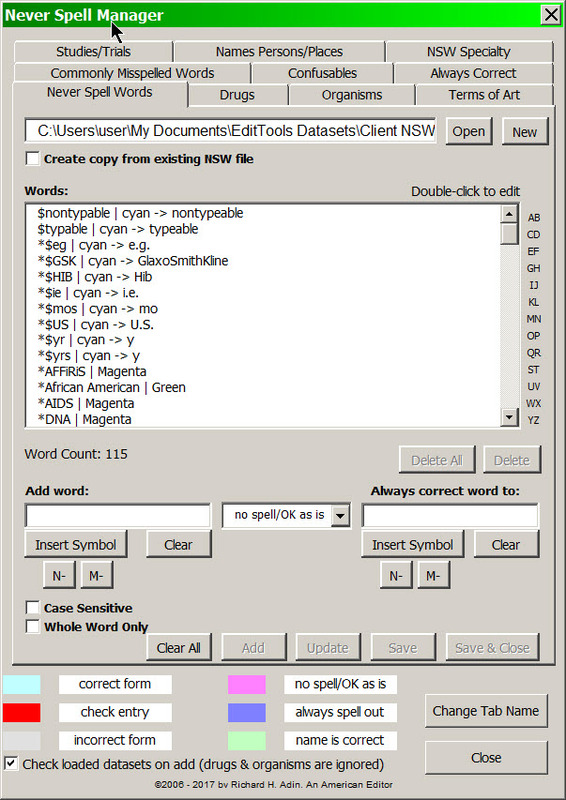 Never Spell Word (NSW) lets me create project- or client-specific datasets. 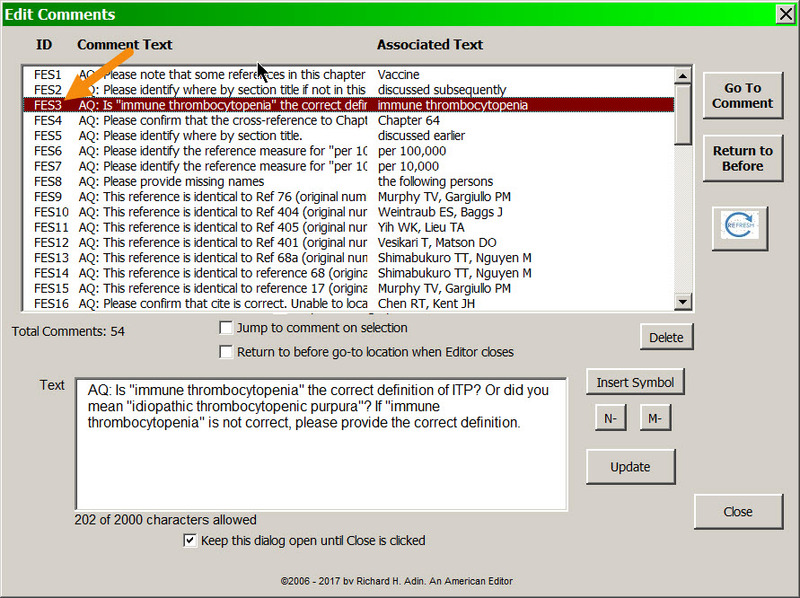 If I know, for example, that the client prefers “distension” to “distention,” I can, using NSW mark every instance of “distension” with green highlighting, which tells me that this is the correct spelling, and change every instance of “distention” to “distension,” which change will be made with tracking on and then highlighted in cyan to visually clue me that a change has been made (I can choose to make the changes with tracking off, but that is not something I ever do). Tip: It is important to remember that the tab names, such as “Drugs,” in the Never Spell Manager, and in nearly all managers, can be changed to whatever name best suits your editorial business. Use the Change Tab Name button. The tab names that show when you install EditTools are placeholder names. 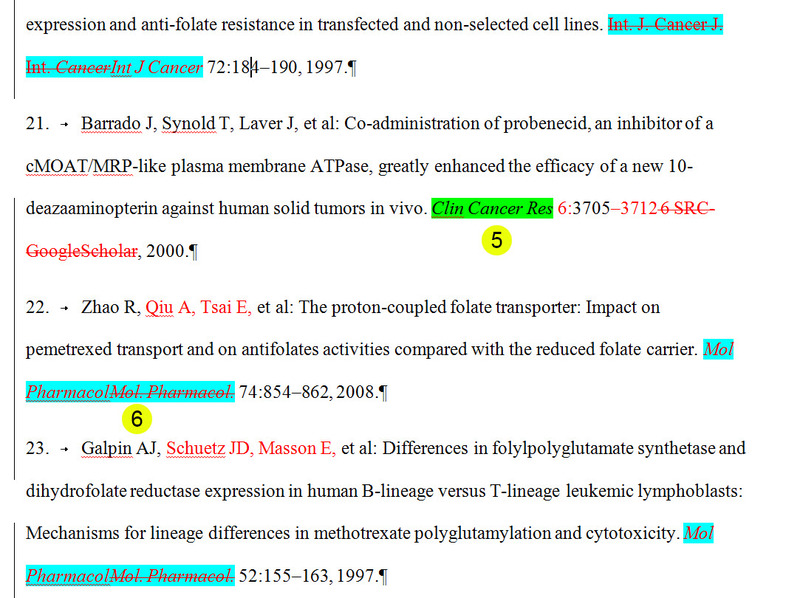 Highlighting is integral to EditTools. Highlighting attracts the eye and by using different highlight colors, I can, at a glance, tell whether I need to review or check something. Because of the types of books I work on, it is not unusual for Word to put a red squiggle under a word or phrase that is actually correct — it just isn’t in Word’s dictionary. Most editors would stop and check the squiggled word, but, for example, if I see it is highlighted in green, I know that it is correct and I do not have to check it — I know I have already checked the word and then added it to a tab in the Never Spell Manager. The cyan tells me at a glance that this has been changed by NSW. If the change is incorrect for some reason, I can reject the change, which is why I do it with tracking on. I use NSW as a way to implement stylesheet decisions, as well as client preferences. An example is “F/M” (#2 in above image). The nice thing is that I do not need to format the entry. 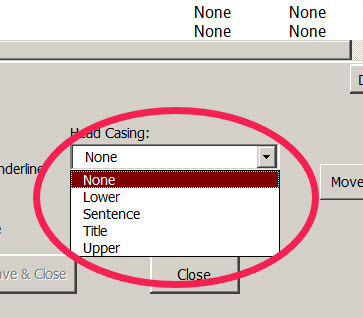 The Never Spell Manager, shown below, makes it easy — I just fill in the blanks, and if appropriate check one or both checkboxes, and click Add. I can easily correct an erroneous entry by double-clicking on it, correcting it, and clicking Update. And the Manager stays open and available until I click Close. With this Manager, I can make additions to any of the tabs. 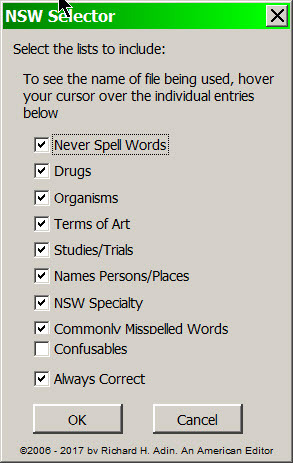 I also use NSW as a way to mark things I already know are correct or incorrect and need changing so that I spend less doing spell checking tasks and more time doing higher-level editing. When I come across a new term, such as the name of a new organism, if appropriate I add it to one of the NSW datasets after I verify it so that next time it will be highlighted and, if necessary, corrected. For example, authors often type ASO3 rather than the correct AS03 (the first is the letter O then second is a zero). Having come across that mistake often, I added the instruction to change ASO3 to AS03 to my Commonly Misspelled Words dataset. Another example is the word towards. The correct spelling in American English is toward, so I added the word towards and the correction (toward) to an NSW dataset. In this example, I am running all of the datasets except the Confusables dataset. Tip: Using only the datasets that are applicable to the project allows the NSW macro to complete faster. This is especially true as your datasets grow. 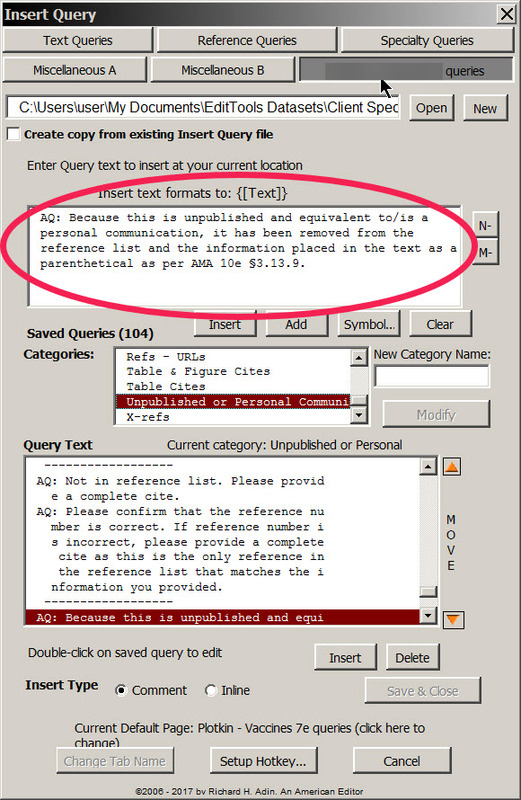 I run the NSW macro over the main text; I do not run it over the reference list. My habit is to move the reference list to its own document after I style/code and do cleanup, but before I run NSW. The NSW macro requires the placement of a bookmark called “refs” at the point in the manuscript where I want the macro to stop checking text. 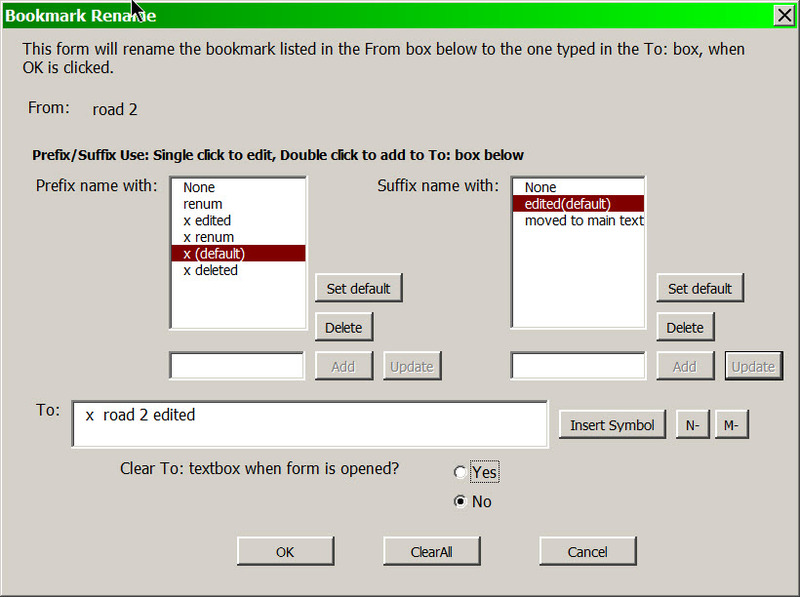 Consequently, I do not have to move the reference list to a separate file if the list is after the material I want the macro to go over — I can just put the bookmark in the reference list head or in a line that precedes the list. 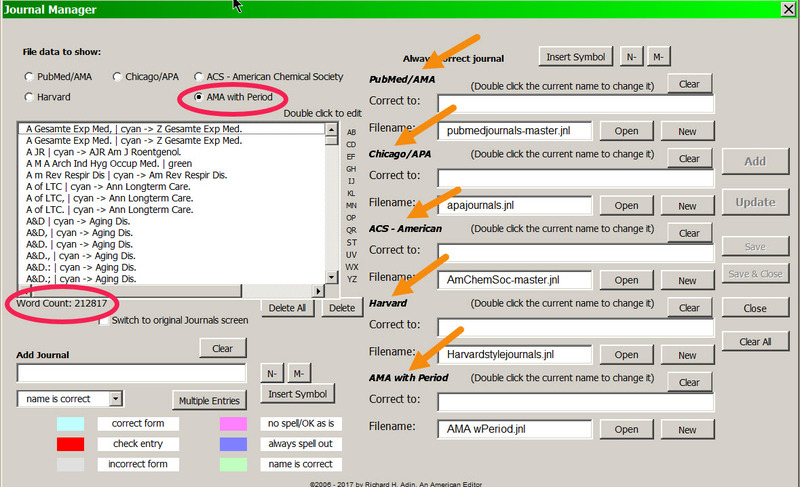 I move the reference list to its own file because my next step will be to run the Journals macro, and that macro works faster and better when the reference list is in its own file, especially if the dataset is large as mine are (e.g., my AMA style dataset runs more than 212,000 entries). As I said earlier, I keep the Never Spell Manager (shown above) open while I edit. 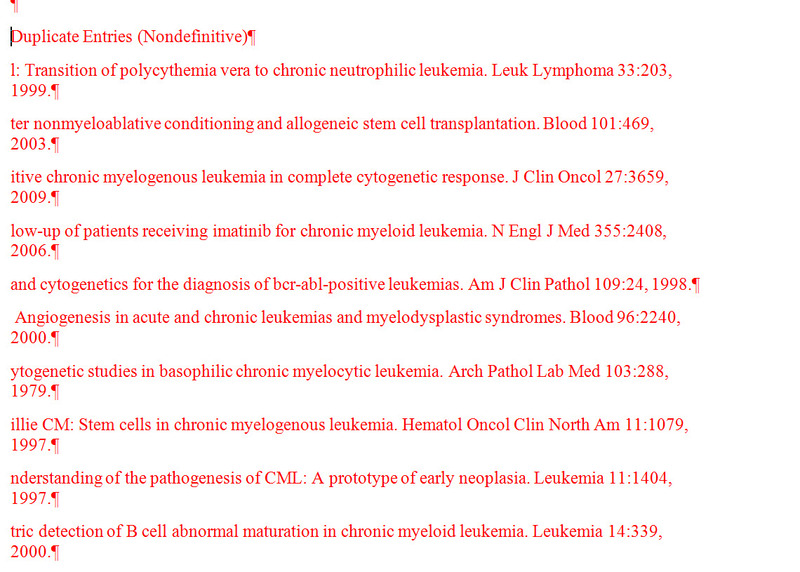 Doing so lets me add new material to the various datasets as I edit the manuscript. The idea of the multiple tabs is to be able to have specialized datasets that are usable for all (or most) projects; for me, only the Never Spell Words dataset is project/client specific. When I come across the name of a study, for example, such as AFFIRM (Atrial Fibrillation Follow-up Investigation of Rhythm Management), I enter the information in the Studies/Trial tab dataset, because that is information that is neither project nor client specific. I also keep open the Toggle Managers because when I come across something like the AFFIRM study I want to enter it into the appropriate Toggle dataset, too. 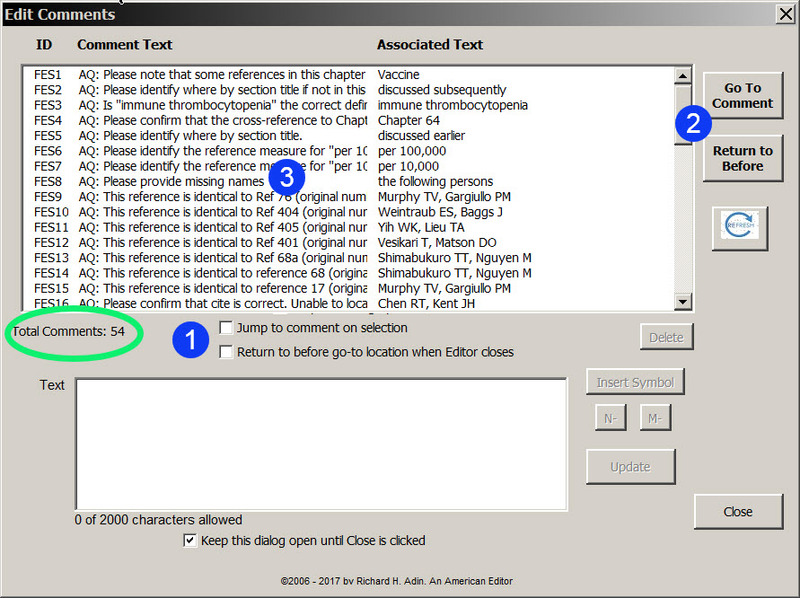 But the Toggle macro is the subject of a later Roadmap essay (The Business of Editing: The AAE Copyediting Roadmap VIII). After running NSW, it is time to turn attention to the reference list. The Journals macro and the Wildcard Find and Replace macro are the subjects of The Business of Editing: The AAE Copyediting Roadmap VI. 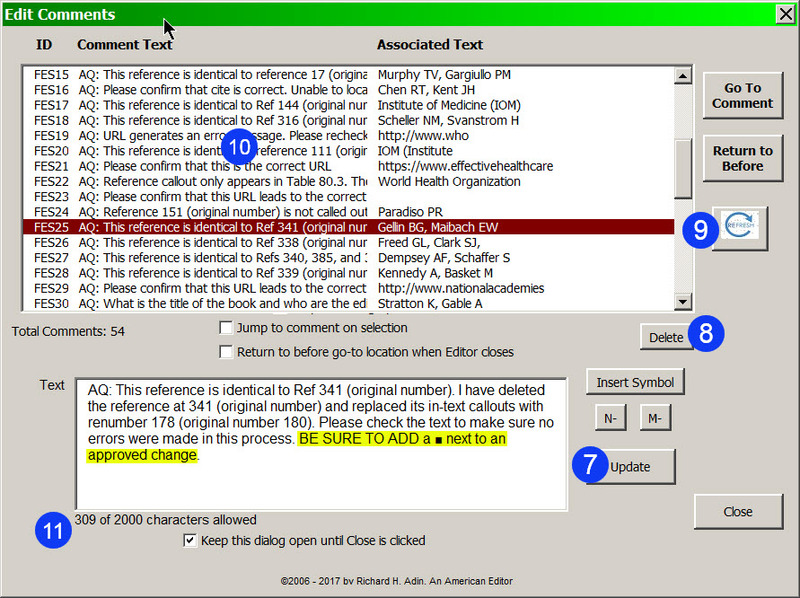 A manuscript is generally “tagged” in one of two ways: by applying typecodes (e.g., <h1>, <txt>, <out1>) or by applying styles (e.g., Word’s built-in styles Heading 1 and Normal). My clients supply a list of the typecodes they want used or, if they want styles applied, a template with the styles built into the template. Occasionally clients have sent just a list of style names to use and tell me that, for example, Heading 1 should be bold and all capitals, leaving it to me to create the template. The big “issue” with typecoding is whether the client wants both beginning and ending codes or just beginning codes; with EditTools either is easy. Some clients want a manuscript typecoded, but most clients want it styled. Style Inserter relies on a template. 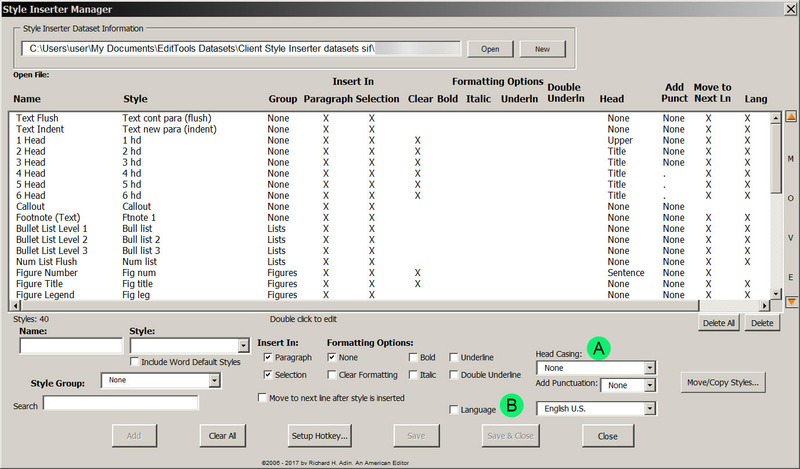 Usually the client provides a template, but if not, the client at least provides the names of the styles it wants used and a description of the style (e.g., Heading 1, All Caps, bold; Heading 2, title case, bold; etc.) and I create a template for the client. Occasionally the client uses Word’s default styles. Once there is a template, I open Style Inserter Manager, shown below, and create styles that the Style Inserter macro will apply. As you can see, Style Inserter Manager gives me a great deal of control over the style and what it will look like. 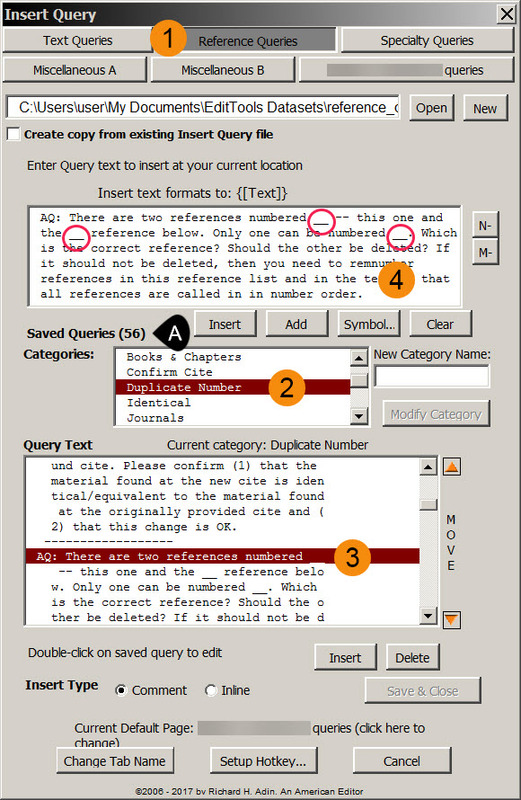 When styles are applied in Word, one has to go through several steps to apply it. Style Inserter is a one-click solution. The information I entered into the Manager is translated into the Style Inserter macro (shown below). I organize the dialog how it works best for me and keep it open as I style the manuscript. A single click applies the style and can move me to the next paragraph that requires styling. Take a look at the Style Inserter Manager shown earlier. 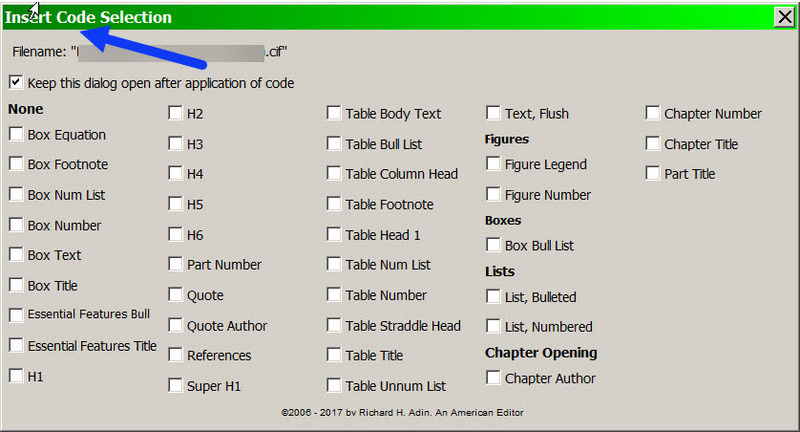 There are several formatting options available but there are two I want to especially note: Head Casing (#A in image) and Language (#B). Whatever capitalization style I select will be imposed on the head as part of applying the style. No extra steps are required once the capitalization requirements are made part of the style in the Manager. 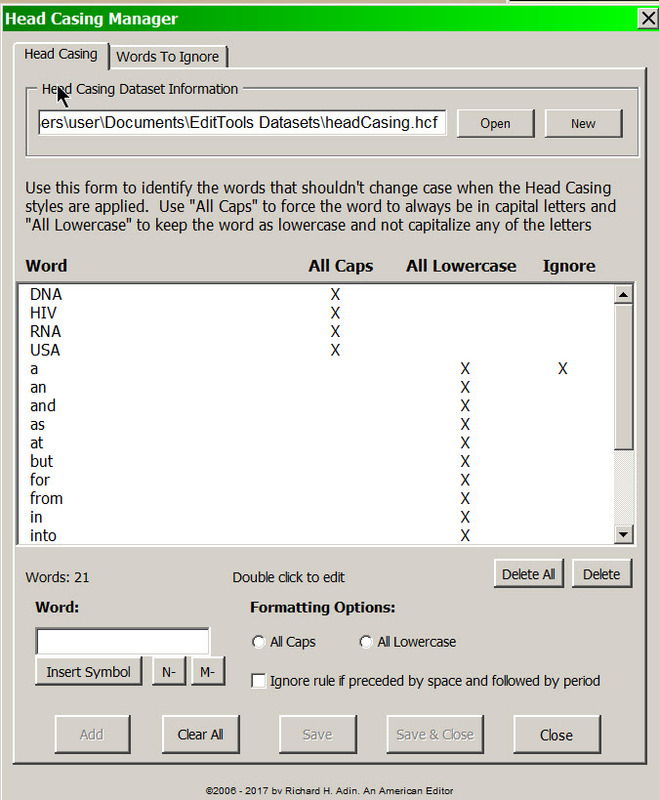 Title case capitalization is governed by the Heading Casing Manager, which is found in the Casing menu on the EditTools toolbar. The Heading Case Manager (shown below) has two tabs: Head Casing and Words to Ignore. In the Head Casing tab you enter words or acronyms that are to always be all capitals or all lowercase. In addition, you indicate if that “always rule” is to be ignored. 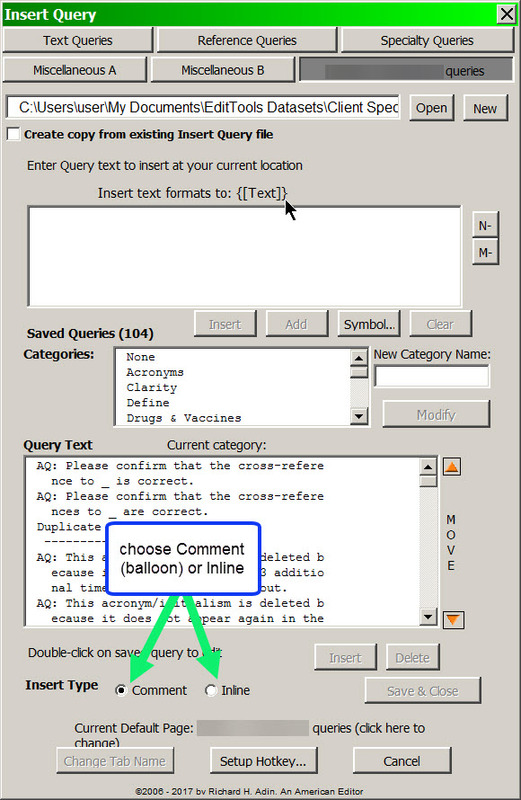 The Words to Ignore tab is where you list words that should be ignored when casing is applied, such as Roman numerals and symbols or acronyms like “miRNA”. Thus, for example, even though the instruction is that the head is to be all capitals, the “mi” in “miRNA” will remain lowercase. This works the same in the Code Inserter Manager. 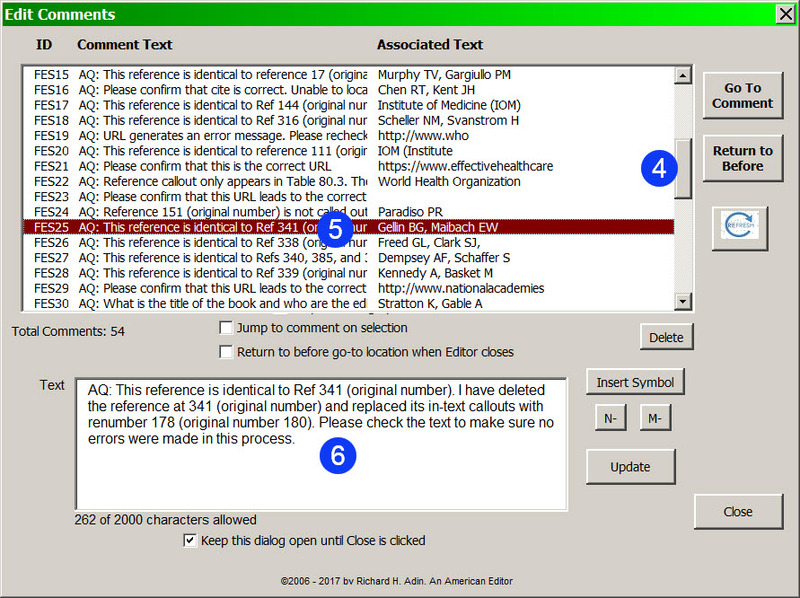 The Language option (#B in the Style Inserter Manager image above) is also important. One of the frustrating things for me is when I am editing and I realize that the authors (or some gremlin) set the paragraph’s language as Farsi and when I correct a misspelling it still shows as a misspelling because I am using American English. The Language option lets me choose the language I want applied (see image below). 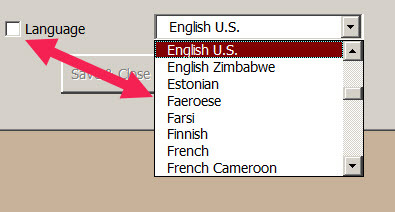 Selecting the language from the dropdown (here “English U.S.”) and also checking the Language box, will incorporate into the style that will be applied by Style Inserter the instruction to set the language to what I have chosen — overriding the language attribute that is present in the manuscript. I make it a habit to incorporate the language instruction in every style. It saves me from wondering why the red squiggly line appears under a correctly spelled word, thereby removing an obstacle that slows editing (and lowers profitability). This works the same in the Code Inserter Manager. 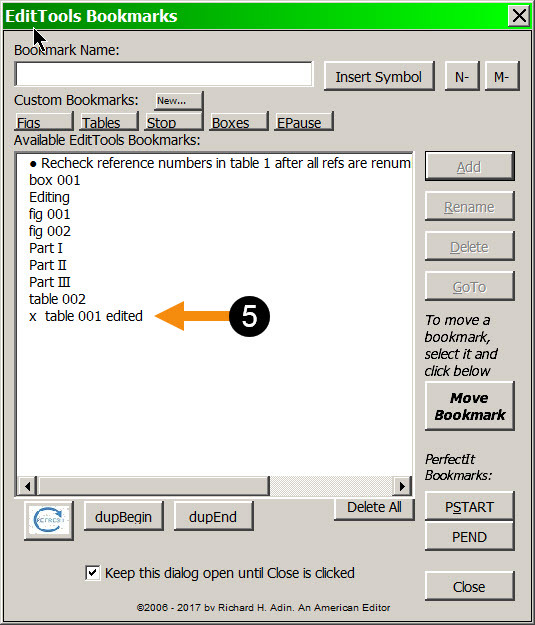 As I style the manuscript, I also insert bookmarks using EditTools’ Bookmarks. 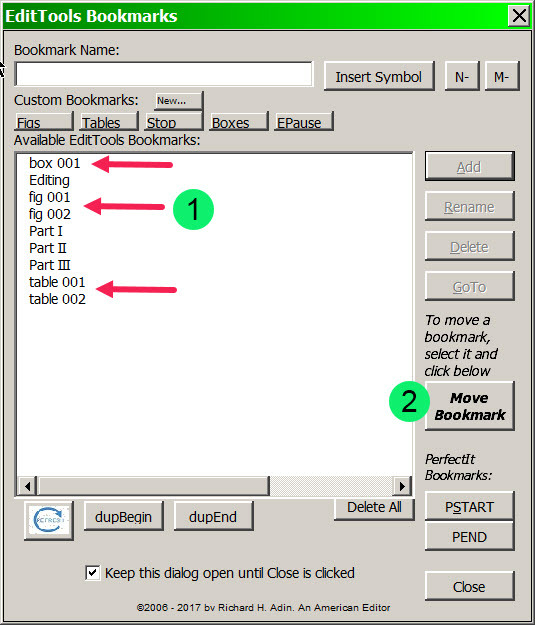 The bookmarks let me track elements of the manuscript. This is especially true because with EditTools’ Bookmarks I can create meaningful bookmarks, which is where we will start in The Business of Editing: The AAE Copyediting Roadmap IV. But before we get to Bookmarks and the next essay, I want to mention another EditTools macro: Combo Click. I have found that when I do certain tasks I like to have certain macro managers open. 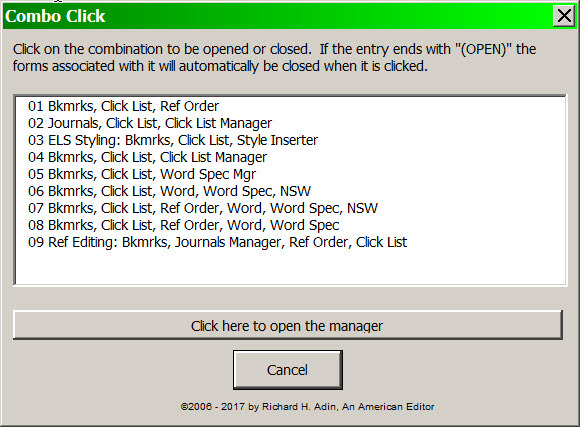 Combo Click, shown below, lets me choose my combination of managers that I want open. Instead of having to click on each manager individually, I click on the combination in Combo Click and those managers open. The idea is to do as much work as possible quickly and with a minimum of effort. When I first set up, for example, Style Inserter, it takes a few minutes that I would not have to spend if I simply used the standard Word method. So editing chapter 1 may take me a few minutes longer than if I weren’t creating the Style Inserter dataset, but all subsequent chapters will take me less time than without Style Inserter. My point is that the smart businessperson looks at the macro picture, not the micro picture. 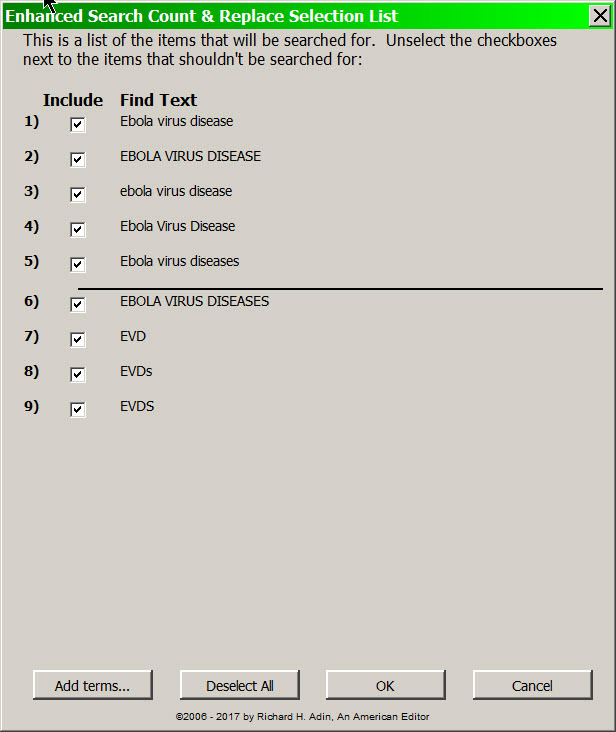 EditTools works using datasets that the editor creates. Those datasets are the wheels — you create them and reuse them. The next project I do for the client means I can load a previously created Style Inserter dataset and I can add those styles that are not already included and delete those that are no longer needed — a faster method than starting from scratch — and then save the new dataset under a new name. 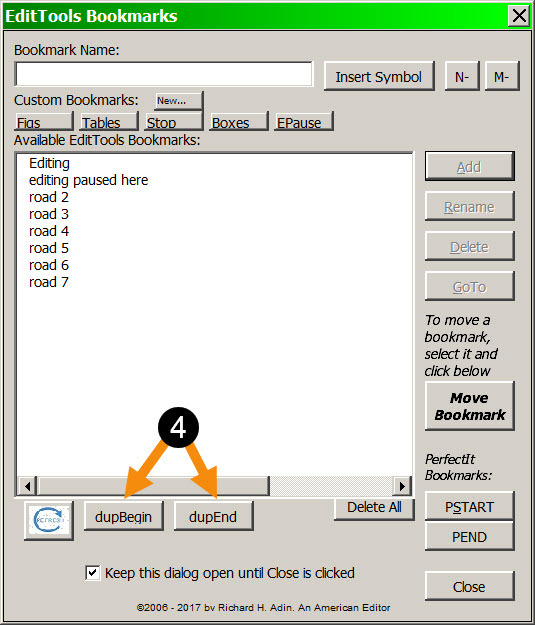 The Business of Editing: The AAE Copyediting Roadmap IV picks up with Bookmarks and how I use them to help me remember to perform certain tasks and to navigate the manuscript.